Black Soap Bars abound at SpaFetish! In an era when shallow appearances seem to be celebrated far more consistently than things of true benefit, we are honored that our Black Soap remains the best-selling of all our natural soap. Despite its odd appearance and mystifying name, our customers will surely agree that there is something curiously stylish and just plain perfect about our organic Black Soap Bars. But, what is Black Soap?! 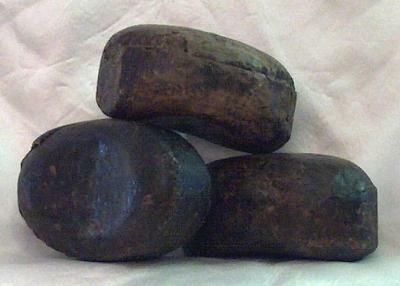 SpaFetish® Black Soap Bars are imported from Ghana, West Africa where they are handmade from an age-old recipe of Fair Trade Shea Butter, Aloe, Palm Kernel Oil and Plantain leaves. Moreover, though Black Soap has become popular in name as well as efficacy, it may surprise you to know that "Black Soap" is not actually "black" -- as the name suggests. On the contrary, genuine African Black Soap is truthfully brown in hue. It seems that this indigenous soap was aptly named for the gorgeous black people of Africa who have lovingly sculpted it for several generations. Yet, make no mistake about it! No other soap is as highly sought after by people of all races who use it to prevent and heal acne, treat Eczema, Psoriasis, Ringworm or aid in the prevention of premature wrinkling. Additionally, Black Soap has been long celebrated for ridding the scalp of dandruff, eliminating bumps and improving the skin's texture -- all while curing foul odors at every corner. Thus, if you are an athlete -- or you have a teenager who is prone to sweat and odor -- no other soap will deodorize the body like our Black Soap Bars. Plus, if you enjoy a rich lathering and completely natural soap bar, nothing else compares! There are many imitations, but SpaFetish® Black Soap is THE truly organic Black Soap that hails directly from the shores of Africa! Curious?! Try it and you too will see what the fuss over our Black Soap is about! This is a single serving of Black Soap imported directly from Ghana, West Africa. And, at 5 oz., this Black Soap Bar is a pure hunk of environmentally friendly beauty that lasts and lasts! A gratis shower puff sponge is included. This is a double serving (two) of our Black Soap Bars. You’ll save $2 when you buy two, instead of just one. And, each Black Soap Bar is 5 oz of completely natural soap -- imported from Ghana, West Africa! Two gratis shower puff sponges are included. Within this pack, we offer THREE Black Soap Bars for just $24 – a savings of $6. Needless to say, there are many imitations, but this is the genuine Black Soap directly from the shores of Ghana, West Africa! Three gratis shower puff sponges are included. For those of you who crave more Black Soap for your money, we offer six SpaFetish African Black Soap bars at a considerable discount. This is a $15 savings, as opposed to buying one bar at $10 per Black Soap Bar. A gratis handmade natural soap bar is included from our SpaFetish collection. You asked for it and here it is! For OUR die-hard Black Soap devotees, we proudly present one full case (12 Black Soap Bars) at a $30 savings, as opposed to spending $120 for the regular price of $10 per bar. This provides our SpaFetish retail clients the perfect opportunity to stock up and save BIG -- without having to carry a wholesale account with us. It's quite a fab deal, if we do humbly say so ourselves! A gratis 9 oz. bottle of our Liquid Black Soap is included. This is our legendary Black Soap Bar in liquid form. Use this precious Black Soap Liquid as a Body Wash, Face Soap or Shampoo. 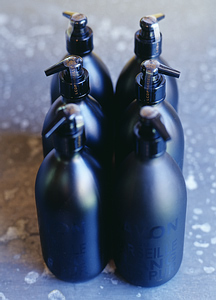 Each bottle of liquid Black Soap is 9 oz. and served in a recyclable bottle. A gratis 9 oz. Shea Body Lotion is included.